Hotel connectivity expert, eRevMax has completed 2-way integration with Winhotel PMS. Mutual hotel customers can now get the benefit of automatic distribution of availability and rate to third party online booking sites whenever they are updated in the property management system and receive reservations from OTAs seamlessly. Developed by Sequoiasoft, Winhotel PMS is one the largest property management systems in the French market and recommended by leading hotel chains like Logis, IdéHotel – SEH (InterHotel, Relais du Silence, Ptit Dej Hôtel, Qualys Hôtel), Châteaux & Hôtels Collection, Cadhi and UMIH Purchases. eRevMax’s distribution solutions are used by over 9000 hotels to update inventory and rates across various booking channels and seamlessly manage availability in the PMS as soon as a booking comes in. “Sequoiasoft is delighted with this new partnership, which will offer an additional choice for channel managers to our customers and prospects. By connecting our PMS Winhôtel and CBP hotels to RTConnect solution, our hotel customers can take advantage of the power of eRevMax’s distribution solutions to market their rooms and increase their visibility on online booking sites,” said David Falcon, Product Manager at Sequoiasoft. “This interface compliments our continuous efforts to offer our hotel customers superior connectivity between their technology solutions and OTAs. Our integration with Sequoiasoft eliminates the need for accommodation providers to maintain online inventory manually across each booking website and manually re-enter online reservations from booking websites into their PMS. This results in saving time, overheads and resources, while also helping avoid manual mistakes,” said Ashis Saha, SVP – Project Management, eRevMax. Hotel connectivity expert eRevMax has completed two-way integration with Scottish hospitality solution provider hoteliport. Through this partnership, hotels using the hoteliport PMS will be able to update all the channels available in the eRevMax Channel Ecosystem, directly from their hoteliport dashboard. hoteliport Hotel Management Software, developed by acdit.com, equips hoteliers with a rich suite of tools for management of reservations, rate-plans, agents, sales channels, billing and performance reporting. “Our integration with eRevMax into hoteliport connects our PMS channel manager module with a host of Online Travel Agents, GDS and meta-search solutions and compliments the already rich suite of hotel management tools that hoteliport provides. Now, hoteliport automatically distributes rates and availability and downloads new bookings into the PMS via RTConnect, saving hotels countless hours of work on various OTA extranet sites while optimizing their online marketing efforts,” said Craig Dunn, Founder, hoteliport. “Our interface with hoteliport provides small-to-medium sized hotels ability to access and manage a whole range of online channels cost effectively without worrying about maintaining inventory manually across each booking website. A greater number of hotels can now leverage the benefits of our Channel Ecosystem while streamlining their distribution efforts,” said Ashis Saha, SVP – Project Management, eRevMax. Beacon Hotel & Corporate Quarters has recommended eRevMax distribution solutions for improving online sales. One of Washington DC’s premier hotel, the property has been using RTConnect for managing rates and inventory on multiple online sales channels directly from its property management system. 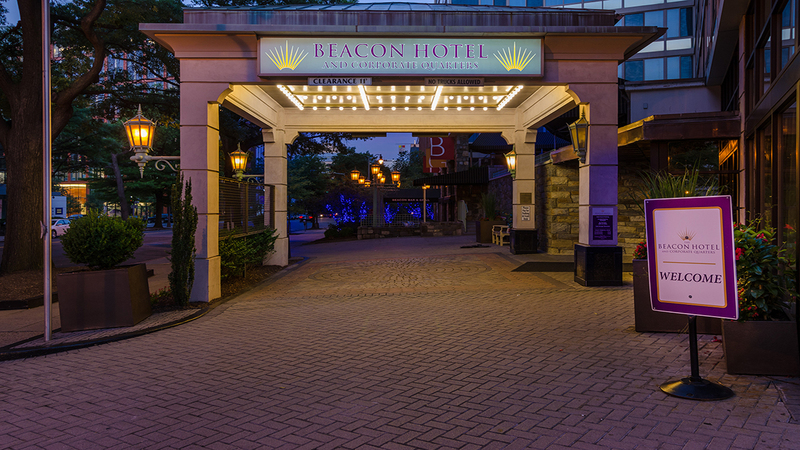 Beacon Hotel & Corporate Quarters, an upscale boutique hotel with 199 rooms, caters to business and leisure travellers – both international and domestic. The team is leveraging RTConnect to manage rates and inventories in real-time to ensure availabilities are up to date on all sales channels for maximizing booking opportunities. RTConnect assists hotels to manage their pricing strategy, monitor booking pace and demand analytics in real-time via the reporting dashboard. “We have been using eRevMax for a few years now and up to today everything is great. Very reliable and the customer service is always helpful and are committed to resolving any issues in a timely manner. I will definitely recommend eRevMax to all my colleagues and partners in the hospitality industry,” said Edith Mendoza, Reservations Manager – Beacon Hotel & Corporate Quarters. “As a technology partner, we are committed to empowering our clients with tools that help ease their day to day work. RTConnect provides a key integration between the Beacon Hotel’s property management system and the OTAs, thereby helping them to manage availability and rates centrally from one single interface which helps simplify operations, improve efficiencies and gives the revenue team time to focus on strategy,” said Alex Moura, Regional Sales Director North America, Brazil and Caribbean at eRevMax. 133 million Chinese travelers took international trips last year – that’s more than the population of Japan – the world’s 10th most populous country. And if we consider the spending of Chinese travellers who spend nearly equivalent to what American, German and British tourists spend, it’s no wonder globally hotels are focussing on China specific marketing campaigns. Chinese free independent traveller (FIT) has become the talk of every trade event and conference. With affluence and sophistication, more and more travellers are seeking experiences, and shedding tour operators. More than 70 percent of Chinese outbound travelers now plan and travel independently, a huge shift in their travel behaviour. According to a recent report, about 68% Chinese Independent travelers are millennials with high disposable income and education degree. And predictably, they prefer online. While traditional tour operators still get the biggest share of the pie, about 20% of all travel bookings are made online. That makes it about 26 million people who usually book online. After Ctrip’s partnership with Qunar, the local OTA giant – Ctrip now controls about 60% of China’s online travel market, well ahead its closest rival Alibaba Travel with 15% market share. Travelzoo, over 85% of their Chinese members rely on travel apps for the easiest way to book a holiday, and over 70% plan to book flights, cruises, package holidays and hotels via apps – a stark contrast from their European counterparts who have shown resistance to adapt to mobile. Chinese have their own social network, and they are in love with them. Chinese Internet users spend majority of their time on social networks – so if you are not visible in Weibo or Wechat, chances are that you are unlikely to capture their attention. As China starts expanding its tourism industry, catch them early. The potential is enormous. To reach out to Chinese Travelers, connect with us. We offer 2-way XML connectivity with all leading Chinese OTA and metasearch sites. 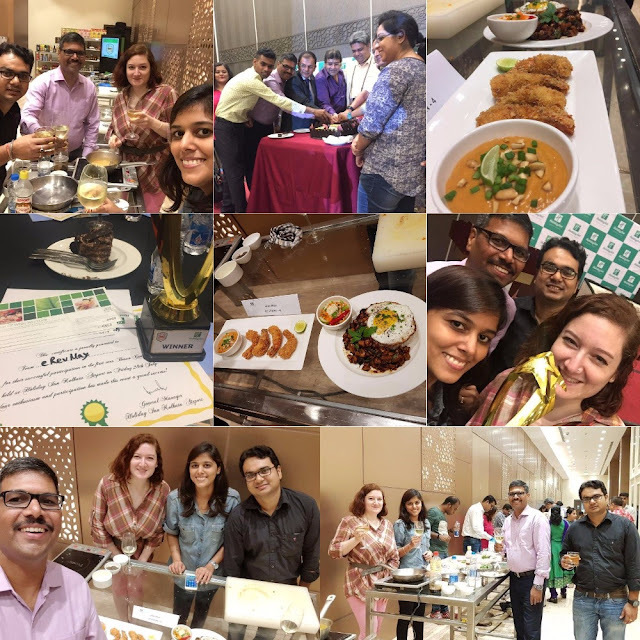 Holiday Inn Kolkata hosted the first edition of Bosses Cook-off on 28th July 2017 and invited the top bosses of select corporates in the city for a cooking competition along with a team of their employees. Our CTO, Udai Singh Solanki received the invitation and decided to participate. He chose a team of 4 members – Aditya Mohanty, Isabella Grundmann and myself, Meenakshii Shivnani, with Udai being the team lead. The theme for the evening was ‘Asian’ and we needed to prepare one main dish live at the venue. So, we brainstormed and decided on a Thai dish – Gai Pad Krapow (Thai Chilli Basil Chicken) with a pickled raw papaya and vegetable salad. When we reached Holiday Inn for the competition on Friday evening, we were in for a surprise. What we saw was like a mini Masterchef type setup – with a cold section containing a variety of meat, fish and seafood, a vegetable mart with the choicest of vegetables, local and exotic, and lastly shelves full of sauces, spices and other dry ingredients. All participants were explained the rules of the competition and the event flow. And like in true Masterchef style, we were given a surprise task – we had to prepare not one, but two dishes – an appetiser and a main course which must include a protein, starch and vegetable. With only 10 minutes left to start, we had to quickly think of an appetiser to go with our Thai theme. We finally decided on Panko Crumbed Prawns marinated in a Thai red curry paste with a peanut dipping sauce as the appetiser to go with our main chicken dish. At the start of the clock, there was a hurried frenzy on all the tables. We started our preps and were surprisingly done within 30 mins, thanks to the amazing coordination we had as a team. It is interesting to note that all 4 of us come from cross-functional departments, however we made a great team for this competition – the binding factor being a strong passion for food! It became like a team bonding activity for us, thanks to Holiday Inn. While we waited for others to finish, we interacted with the hotel sales team, chefs and the 2 famous food/lifestyle bloggers – Indrajit Lahiri & Poorna Banerjee, called in as the Judges for the evening. What flowed was some good wine and great conversations. During this time we walked around to check out what our competition was up to and saw most teams cooking up mostly dishes from the Pan-Indian region, from Bengali to Punjabi to Rajasthani. However, we believed that our preparation, although quick and simple, was authentic, flavourful and different than what others were doing. The last 15 minutes went by in a blur, our dishes were ready and plated and our work stations were clean. The scoring was to be done on taste, presentation and cleanliness. The 3 judges – the Executive Chef of Holiday Inn and the 2 food bloggers made their way through each of the 8 teams’ tables. After the tasting, we were escorted back into the banquet hall for the announcement of the winners. The first set of awards went for various categories like cleanliness, time management, etc. Finally the actual winners were announced and we were pleasantly surprised to be awarded the 1stprize. Our prize kitty included – a staycation voucher at the hotel, F&B vouchers, chocolates and a “Winners” trophy. The four of us went in not knowing what to expect. We came back with a fun experience of an evening worth remembering! A big shout-out to Holiday Inn Kolkata for organizing a refreshing conceptual corporate event, executing it very professionally and giving us a chance to be a part of its success! InterContinental Istanbul improves efficiency with RateTiger, saves over 1.5 hours daily to focus on strategy. InterContinental Istanbul, one of the luxurious addresses in the Turkish capital, has endorsed RateTiger for reducing workload and time to manage OTAs. The hotel has been using award winning channel management solution from eRevMax to update rate and allotments across online sales channels since 2014. The Turkish hospitality industry is characterized by smaller booking window and high volume online bookings. 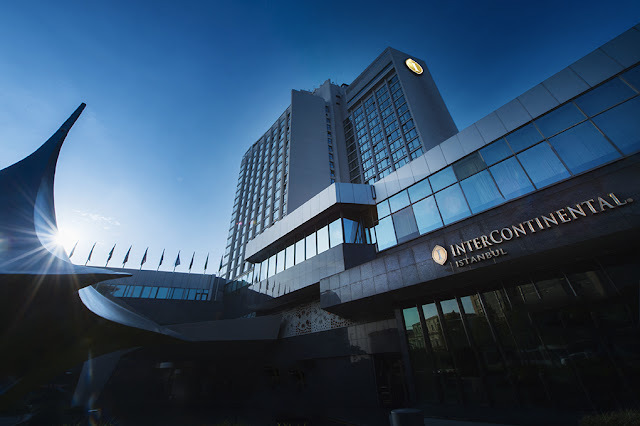 InterContinental Istanbul, a part of InterContinental Hotels & Resorts, is at present, receiving about 65% of their total bookings from online sources. The extreme competition fuelled by additional supply of rooms in the city, safety issues and geopolitical uncertainty has made managing online sales channels even more complex. “Mostly bookings happen at the very last minute – a lot of bookings come in closer to the stay dates, booking window is getting shorter. This has changed the way we do business. We now update OTAs daily – sometimes multiple times a day,” said Nil Hepiseri, Director of Revenue, InterContinental Istanbul. InterContinental Istanbul is leveraging RateTiger Channel Manager to update live rates and availability across multiple booking channels directly from their Property Management System (PMS) using the pooled inventory concept. All reservations made on these distribution channels are captured and available inventory automatically redistributed helping the hotels push last-room availability thus ensuring maximum occupancy. “We are saving over 1.5 hours daily through the automated updates – just one change in the dashboard – and it gets reflected across all connected OTAs. With chances of manual error getting totally eliminated, we can focus on strategy,” commented Nil.